The Minnesota Twins currently have two of the hottest hitting players in all of minor league baseball within their system. First round picks in the previous two MLB Drafts, Alex Kirilloff and Royce Lewis have taken the Florida State League by storm. Their torrid performances have bolstered an already impressive prospect stock, but it’s their card stock that has also seen a significant rise. Baseball cards have long been synonymous with the sport itself. To this day, the Honus Wagner 1909 T206 remains among the most coveted cards in collecting. The time-honored tradition has seen ebbs and flows, and in 2018 we may be seeing the hobby reach new heights. After coming through the junk wax era of the 80’s and 90’s, players like Aaron Judge, Shohei Ohtani, and Ronald Acuna have revitalized an industry literally built on cardboard. Despite Sports Illustrated deeming Hunter Greene the next big thing, Minnesota zeroed in on Lewis and made him the first overall pick of the 2017 draft. He’s rewarded that belief by owning a career .304/.379/.465 slash line through his first 159 professional games. 2016 first-round pick Alex Kirilloff returned to the diamond after missing a full season due to Tommy John surgery, and he currently owns a .378/.397/.566 line in just under 50 games at High-A Fort Myers. The duo is blazing a path on the field, and that’s translated to their memorabilia. Without a doubt, Topps Bowman product line is the gold standard when it comes to collecting prospects. Topps, which owns an exclusive license with MLB, puts out a few Bowman products throughout the year in order to capture both high performers as well as recent draftees. The card to have of a new prospect is always designated with the “1st Bowman” notation in the corner of the image. A first round pick on the field doesn’t always meet expectations, and much like the stock market, their cardboard reacts to those realities. 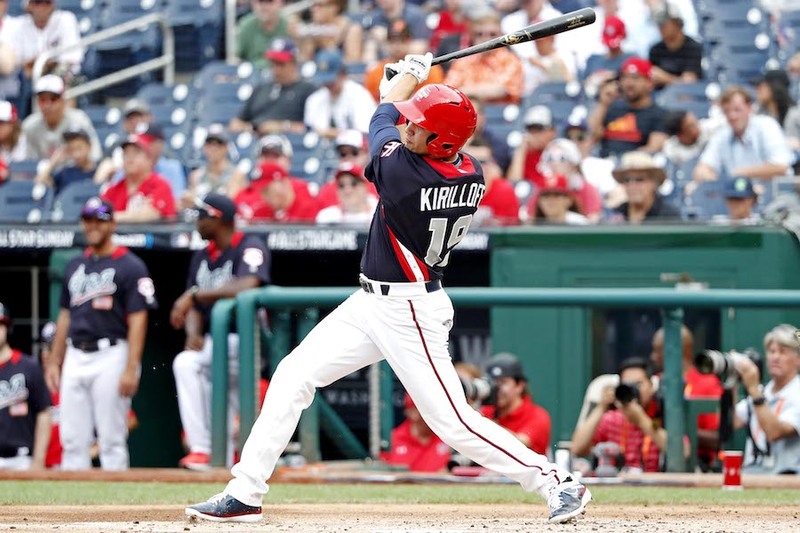 For Lewis and Kirilloff however, they’re blazing a new trail both across baseball and relative to what Twins prospects before them have seen. Recent auction sales have Lewis’ 1st Bowman card, in an ungraded state, fetching a comfortable $135+. 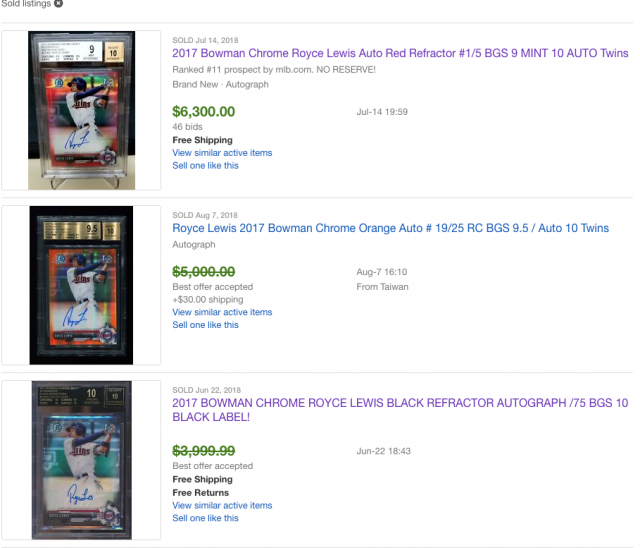 When looking at some of his lowest numbered and most elusive cards, resellers are cashing in for well into five-figure sums. Like his teammate, Kirilloff’s card stock is performing wonderfully as well. Recent graded sales of Kirilloff’s 1st Bowman are trending just under $200 with the elusive parallels commanding significantly more. Looking back over the course of previous drafts, this is somewhat of an outlier. The Phillies selected Mickey Moniak with the first overall pick in the 2016 draft. Right now, you can grab versions of his 1st Bowman cards for as little as $28. Dansby Swanson, the 2015 1st round pick can be had for $60, and the first pick to sign (Brady Aiken turned down the Astros in 2014) during the 2014 draft, Tyler Kolek, costs a measly $5. Mark Appel is no longer in baseball, but his 2013 1st Bowman card nets just $3 in auction today. In fact, you have to go back to 2012 to find something even close to this current hype: Carlos Correa, Astros shortstop and the first overall selection, pushes a market touting roughly $300 for his 1st Bowman cards. It’s certainly fair to question how players like Moniak, Kolek, and Appel can even be considered in the same breath as the Twins young stars. While neither of Minnesota’s prospects have graduated or knocked at the big league door, they’ve performed to significantly higher standards than their counterparts in this category. Joe Mauer, Miguel Sano, and Byron Buxton on the other hand, are all worthy adversaries when it comes to a cardboard comparison. Buxton was once baseball’s top prospect, and found himself selected just one pick after Houston’s Correa. Despite stumbles thus far in the big leagues, he’s still plenty young and has flashed arguably the best glove in the game. His 1st Bowman reaches around $80 currently. Sano, who was an international signee, has seen a market dip due to performance in the 2018 season. An affordable $45 ask is all that his coveted cardboard will cost you. No doubt a Twins Hall of Famer, and likely to be enshrined in Cooperstown as well, Mauer’s 2002 Bowman entry will set you back $46. When it comes to collecting baseball cards, the market behind it, and the hobby surrounding it, there’s a significant number of factors at play. Recency bias is obviously a huge factor, while market stability and the overall state of the hobby itself lends a huge hand. Back in Mauer’s day, innovation wasn’t at the forefront of cards and the market was still relatively flooded. Both Buxton and Sano battle recency bias as well as performance stumbles of their own merits. To suggest a perfect storm surrounding both Lewis and Kirilloff would be summarizing it in the only way possible. Being a buyer or not doesn’t make participation any less fun. Seeing the ebbs and flowsin a tangible way to connect with players and a sport through the eyes of a separate market is at the very least, interesting. Right now, we don’t know what lies ahead for either of the Twins top two offensive prospects, but those that hold their cards will be sure to tell you that the path to Cooperstown is paved with gold. baseball cards.... brings back memories. It looks like prices you are quoting are for Bowman "refractor" cards, which are extremely limited versions of their regular cards. Is that correct? I haven't collected cards in many, many years, but it seemed like these prices were way off unless there was some kind of gimmick to make them rare. 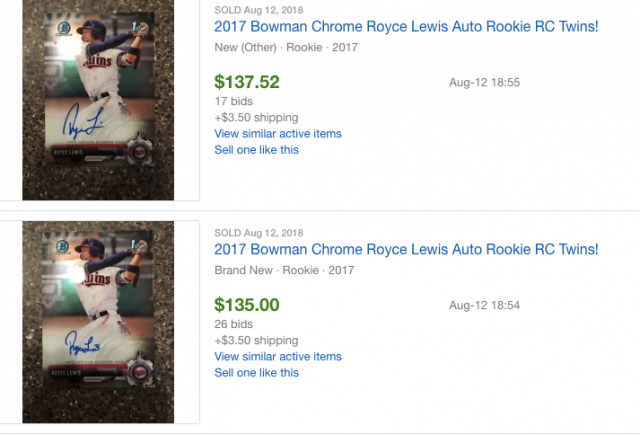 The 5 figure prices on Lewis' cards are for limited parallels. The lower prices are for base chrome cards. All of the prices quoted were "sold" prices and not just asking numbers. You're looking at "base" versions that are unsigned. Also, but using "first" or "1st" instead of just 2017 (which is the same card) you limit listings.